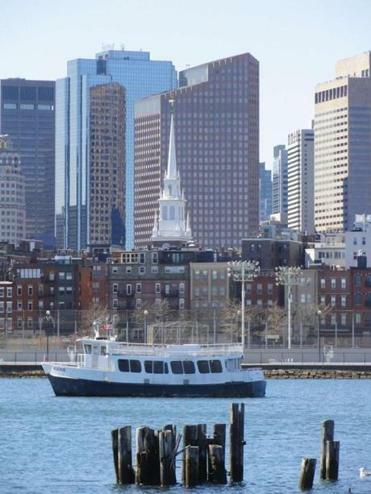 Ferry service will return on summer weekends connecting Hingham and Hull with Logan Airport and Boston Harbor. Stunned local officials cheered the news that — starting Saturday and running through Columbus Day — the MBTA will run weekend commuter boat service between Hingham, Hull, Boston, Logan Airport, and George’s Island. The last time Hingham had weekend summer ferries was 15 years ago, and Hull has not had the service for far longer. “I’m shocked, pleasantly shocked — this did come out of nowhere,” said Irma Lauter, chairwoman of Hingham’s Board of Selectmen. Hull Selectman Domenico Sestito — who commutes to work by boat — was equally surprised and enthused, saying weekend ferries would bring people to Hull’s beaches and businesses, while reducing traffic. “We’ve talked to [the MBTA] for years and years about it. We thought it would be very good for the town of Hull,” he said. MBTA spokesman Joe Pesaturo said the transit agency had already sold hundreds of tickets for weekend service this summer. He said the decision to provide weekend ferries to the South Shore was directly linked to last year’s successful revival of summer rail service to Cape Cod on the CapeFlyer train. The MBTA will offer 14 round trips between Hingham and Boston’s Long Wharf on Saturdays and Sundays, he said, with late-night service on Saturdays and a number of boats making stops at Hull, George’s Island, and Logan Airport. The boats are scheduled to depart hourly from Hingham and Boston, beginning at 8 a.m. and 9 a.m., respectively. There will be two additional round trips on Saturday nights, with the last boat departing Boston at 11:15 p.m., and arriving in Hingham at midnight, he said. The full schedule is available at: www.mbta.com/uploadedfiles/Documents/Schedules_and_Maps/Upcoming_Schedules/Boats/routeF1(2).pdf. A one-way fare between Hingham or Hull and Long Wharf is $8; Logan service is $16, or $8 for those with a valid monthly commuter boat pass. The MBTA ran weekend boats out of Hingham in the summers of 1998 and 1999, but stopped in 2000 because of low ridership. At that time, the Hingham boats competed with ferries operated on weekends from the Quincy terminal on the Fore River. However, all Quincy ferry service ended in October 2013 and the MBTA is selling its Fore River property. Hull had a bustling summer ferry scene at the turn of the 20th century, according to local historians, who said the summer boats peaked in the early 1900s and eventually disappeared. Pesaturo said the MBTA is confident that the new summer service will find riders, especially from the Hingham terminal located in the newly developed Hingham Shipyard, which has numerous restaurants, shops, a movie theater, apartments, condominiums, and a vast parking area. He added that ridership on the Hull and Hingham boats in April was a strong 86,856. “We expect a lot of summer travelers and airport-goers to take advantage of the weekend boat service,” he said. Hingham’s Lauter said she is already planning to take the weekend boat into Boston with her husband for dinner in Boston’s North End. And she will continue to work, she said, on getting weekend service revived on the Greenbush commuter rail line, which has two stations in Hingham. “That may be a pipe dream,” she said. Robert Fultz, Hull’s director of planning and economic development, had tried in 2010 and 2011 to get weekend ferries from Boston directly to Nantasket Beach through a federal grant, but failed to find a company willing to provide the service. Fultz said the next step would be to make it easier to get from the ferry terminal at the end of Hull’s long peninsula to Nantasket Beach at the other end of town. He said Hull would like more frequent MBTA bus service, as well as a proposed electric trolley. “Making these linkages is critical to the town because transportation improvements are fundamental to economic development,” Fultz said.